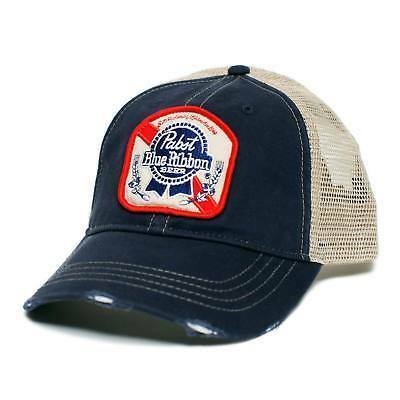 Pabst Blue Ribbon Trucker Hat Men's Pabst Blue Ribbon trucker hat. 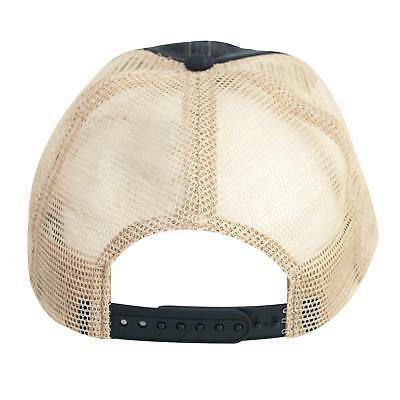 Features the classic "PBR" logo on the front with an adjustable mesh back. Officially licensed. Most orders ship within 1 business day Returns accepted within 60 days Product FAQ Are your items officially licensed? Yes! All of our brand-specific items are officially licensed, and the clothing is manufactured by professional silk/screen printers that hold the licenses for the brand. These are not iron-on transfers. Please note that every vendor uses different garments, and the item may or may not still have the original garment label (for example, your Walking Dead shirt might simply be branded at the neck as Walking Dead, or it may still have an American Apparel tag. This varies by vendor.) Are your items brand new? Do they have tags? Yes! All items are brand new direct from our warehouse in Pennsylvania. Note that your item may or may not come with paper tags. Some manufacturers include them, some do not. Some vendors remove neck tags in favor of printing tag information directly on the garment (tagless shirts - which are super comfy!) Since we only sell online, we do not poke holes in the shirts to attach our own tags, either. Your item is still brand new and licensed. Do you have (this size) in stock? Our currently available sizes are listed in the menu near the Buy button. Our stock updates daily! If there is no size selection, that means the item only comes in one standard size. Do you have this item in another color? Items are only available as shown in the photo. Shipping Information Do you combine shipping? Yes, we combine shipping! Shop thousands of items in our store and combine your purchases for one low shipping rate (and note that most items ship FREE within the USA!) Please purchase all items, or add them to your cart, BEFORE paying so can combine the shipping for you. When will my item arrive? In-stock orders are typically processed and shipped within 1 business day. Standard US mail averages 3-7 business days, while Expedited US mail averages 2-3 business days. If you need your item by a certain date for an event or gift, we urge you to select Expedited Shipping. 's shipping estimates for all methods are not guarantees and can be inaccurate, but selecting Expedited (USPS Priority Mail) has much better chance of arriving within 2-3 business days. International shipping times are described below. Do you ship internationally? Yes! We ship worldwide to most countries. How can I track my order? USA customers: You will receive a USPS delivery confirmation number when your order ships. Note that this can take 48 hours to update and sometimes, it will not update until delivery is made. International Standard Mail: This service does NOT include tracking. The number you will receive is customs form number. You will likely not be able to use this number to track your package. If you require tracking, you may select Express service. Shipments usually take about 2 weeks to arrive, but customs in your country can often cause delays. It is not uncommon for international shipments to be delayed for days or weeks. Please allow at least 8 weeks for delivery. International Express: This service DOES have tracking and is the quickest, safest option. Shipments usually take 1-2 weeks to arrive. Returns Exchanges What is your return policy? We accept returns within 60 days of receiving your order. Buyer is responsible for original and return shipping costs. For this reason, due to free or reduced shipping on our listings, there is a 15% restocking fee deducted from refunds, but we will be happy to waive this fee if you place a new order from our shop (please message us if you do.) Items must be returned in the original unworn, unwashed condition with all original tags if applicable. Laundered clothing or used items can not be returned. If you discover a damaged or incorrect item upon opening your package, we will be happy to assist- please contact us by sending a message before processing the return request through, so we can work with your to resolve the issue. Thank you! Can I exchange for another size or style? If you would like to exchange your purchase, we encourage you to return your original item for a refund, and place a new order ASAP for the item you need. This will ensure that your selection does not sell out before your return is processed. We will gladly waive the restocking fee if you make a new purchase - just send us a message to let us know about your new purchase, and we will take care of it for you when your return is received. What if something is wrong with my order? If you discover a damaged or incorrect item upon opening your package, we will be happy to assist- please contact us by sending a message before processing the return request through, so we can work with your to resolve the issue. Thank you!